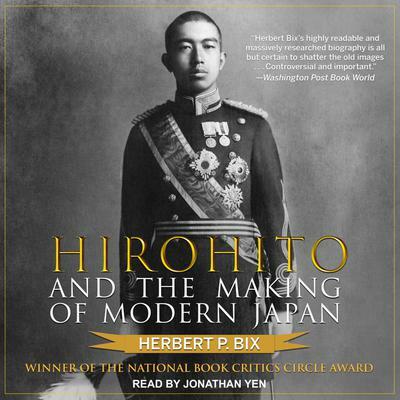 In this groundbreaking biography of the Japanese emperor Hirohito, Herbert P. Bix offers the first complete, unvarnished look at the enigmatic leader whose sixty-three-year reign ushered Japan into the modern world. Never before has the full life of this controversial figure been revealed with such clarity and vividness. Bix shows what it was like to be trained from birth for a lone position at the apex of the nation's political hierarchy and as a revered symbol of divine status. Influenced by an unusual combination of the Japanese imperial tradition and a modern scientific worldview, the young emperor gradually evolves into his preeminent role, aligning himself with the growing ultranationalist movement, perpetuating a cult of religious emperor worship, resisting attempts to curb his power, and all the while burnishing his image as a reluctant, passive monarch. Here we see Hirohito as he truly was: a man of strong will and real authority. Supported by a vast array of previously untapped primary documents, Hirohito and the Making of Modern Japan is perhaps most illuminating in lifting the veil on the mythology surrounding the emperor's impact on the world stage. Focusing closely on Hirohito's interactions with his advisers and successive Japanese governments, Bix sheds new light on the causes of the China War in 1937 and the start of the Asia-Pacific War in 1941. And while conventional wisdom has had it that the nation's increasing foreign aggression was driven and maintained not by the emperor but by an elite group of Japanese militarists, the reality, as witnessed here, is quite different. Bix documents in detail the strong, decisive role Hirohito played in wartime operations, from the takeover of Manchuria in 1931 through the attack on Pearl Harbor and ultimately the fateful decision in 1945 to accede to an unconditional surrender. In fact, the emperor stubbornly prolonged the war effort and then used the horrifying bombings of Hiroshima and Nagasaki, together with the Soviet entrance into the war, as his exit strategy from a no-win situation. From the moment of capitulation, we see how American and Japanese leaders moved to justify the retention of Hirohito as emperor by whitewashing his wartime role and reshaping the historical consciousness of the Japanese people. The key to this strategy was Hirohito's alliance with General MacArthur, who helped him maintain his stature and shed his militaristic image, while MacArthur used the emperor as a figurehead to assist him in converting Japan into a peaceful nation. Their partnership ensured that the emperor's image would loom large over the postwar years and later decades, as Japan began to make its way in the modern age and struggled—as it still does—to come to terms with its past.